Inventory We are a resale marketplace, not a box office or venue. Ticket prices may exceed face value. This site is not owned by Van Wezel Performing Arts Hall . The Van Wezel Performing Arts Hall is the premier venue in the Sarasota metro area for all the best traveling Broadway shows as well as touring artists. The theater was built in 1968 and has a seating capacity of 1,736. 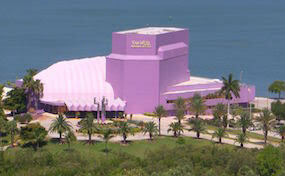 The Van Wezel Performing Arts Hall box office is located at 777 N Tamiami Trail in Sarasota, Florida. Van Wezel Performing Arts Center Tickets have included shows like Book Of Mormon, Mamma Mia, Beauty And The Beast, Wicked, and the Producers. VanWezel.TheatreSarasota.com is not a part of any primary website, venue, and or box office. We are a privately owned and operated company that deals almost entirely in the online retail of all events in the secondary resale ticket market. Many of our prices are above face value but they will fluctuate with demand. To order all tickets to Van Wezel Performing Arts Hall Sarasota events please follow the process online through the checkout or pick up a phone and call our operators at your earliest convenience.